HQ Re-release with better raw. - Ooki's SD sometimes looks like Caroline's experimantal animaton SD from the ParaKiss end credits. - Otherwise, upon closer look this school is a bit weird? I mean very much budget appearance for one of the richest countries. There are unfinished pipes sticking out of the walls, there isn't the slightest trace of hi-tech in it, I mean the story takes place in today's Japan, doesn't it? Those "lightsaber" neon tubes on the ceiling have been banned from european schools years ago for degrading youths' vision quickly and efficiently. I assume this is a publicly funded high school? Is this normal to build these in such a minimalist way in order not to spoil the japanese teenagers, save on state expenditure or what? >I mean very much budget appearance for one of the richest countries. There are unfinished pipes sticking out of the walls, there isn't the slightest trace of hi-tech in it, I mean the story takes place in today's Japan, doesn't it? lol, you have a very misguided image of japan, sure some of the major cities(or parts of them) are quite hi-tech and look "rich" but this is probably an accurate image of what a high school of a small town in japan looks like. 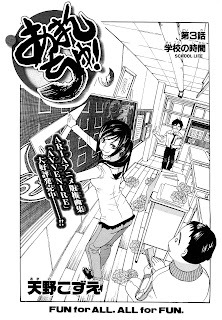 That teacher really reminds me of Akira. In any case, she's a babe. >Those "lightsaber" neon tubes on the ceiling have been banned from european schools years ago for degrading youths' vision quickly and efficiently. I think this part of Europe haven't heard about that. And also it sounds strange. Well the school actually look better than any school here. Btw, Ooki is <3 , but I've already said that when this ch first came out. Amanchu! is set in the town of Ito, on the east coast of the Izu peninsula in Shizuoka prefecture. It's a middling-sized town (about 80,000 people) by Japanese standards. Japanese public schools are built to a standard pattern, and the older ones don't have airconditioning or much in the way of heating systems either. The Japanese think it's character-building. BTW could one of the Amano team contact me please via my webpages about maybe collaborating on some Aria scanlation? Sorry, I don't do IRC. Amanchu! is set in the town of Ito, on the east coast of the Izu peninsula in Shizuoka prefecture. Amano also put in some landmarks from other places in that region, so the exact town is perhaps a bit hard to pinpoint. But yeah, Ito is perhaps the most likely candidate. but. i have a question. I made korean version amanchu by use this translation. This translation is a translation of the Chinese language? or Japanese?